At Last, A Mystery Solved! Those of you who have spent time browsing these Tang pages may have noticed the Tang sticker on Brenda McCrary's "child with tambourine" on the pevious page. 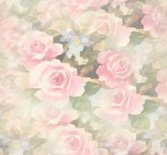 Thereupon hung the resolution of a mystery, though I didn't know it at the time because I hadn't seen a photo of the base. 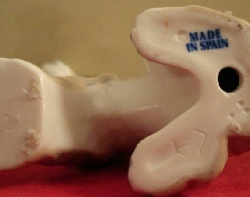 More recently, collector Jorge Luis Gonzalez emailed me to tell me excitedly he thought he'd found the answer to a long-standing mystery among Lladró collectors - and that is that we keep finding items marked "Made in Spain," usually in cobalt blue block caps, but with no maker's marks. 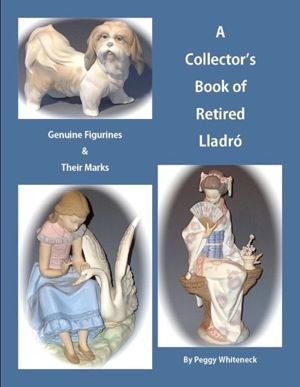 The reason these items were so curious to collectors is that they look an awful lot like genuine Lladró - much more so than any of Lladró known imitators who consciously strive and mostly fail to emulate Lladró's distinctive style. We collectors were constantly wondering and conjecturing on what to make of these items. What Jorge had discovered was a recent acquisition for his own collection that bore the same Tang sticker as on Brenda's item, but he supplied the missing piece of the puzzle: a photo of the base with the same block-letter cobalt blue "Made in Spain" mark that we had seen on other unmarked items. 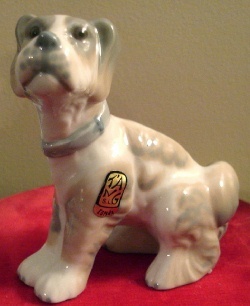 Subsequently, another collector told me that she has an item pictured in my "Made in Spain-No Mark" section of "El Portal Porcelana" but with the Tang sticker found on Jorge's dog. 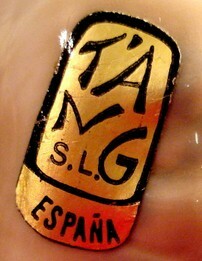 It should also be noted that the Made in Spain mark is simple enough to be copied on manifestly inferior products. It takes time and experience for consumers to evolve into collectors who are able to tell the difference between superior and inferior quality in product comparisons. So whether or not a given item marked "Made in Spain" is a Tang or Rosalor some inferior brand depends upon those quality judgments and the consumer's ability to make them.